For kids to have a truly rewarding experience, they need to have a place conducive for working and a sewing machine compatible to them. The best sewing machine for kids must make sewing easy. It must safe to use while kids put their imaginations to work. 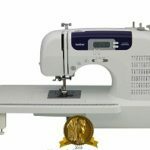 We have featured here our three top sewing machines which showcase the characteristics that you ought to be looking for. These are Janome 15312, Haitral HT-CS141WPU, and Singer Simple 3223. When you start shopping and narrowing down your choices, remember that you’re not buying them toys. Sewing machines are working tools, so look for products that are solidly made. 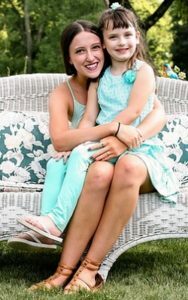 They must be capable of holding up to a child’s curious and oftentimes careless nature. 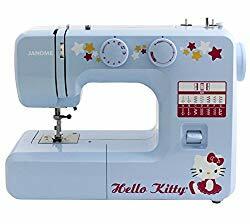 Janome 15312 is one such machine. 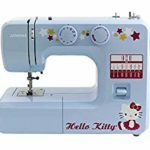 Kids will surely warm up to its Hello Kitty design, making the prospect of sewing less intimidating. But don’t let the kitty cartoon fool you. Janome 15312 is a full-sized, full-featured sewing machine that adults can use as well. 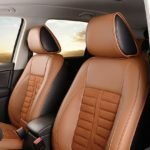 Its interior is sturdily constructed with high-grade aluminum. We’d like to emphasize that you must teach your kids about operating this machine first before leaving them on their own. We recommend it for kids 10 years old and above. Its top speed is 860 stitches per minute and can take the demands of adult projects very well. It sews through multiple layers, too, so that should give you an idea of how tough it works, it was definitely Sophie and my favorite machine that we enjoyed doing sewing projects together when she first started to learn how to sew. Automatic functions will make their learning experience less tedious and so much more enjoyable than if they had to adjust every single thing manually. They will also be able to focus on the whole aspect of sewing and not on the sole activity of making the machine run. Janome 15312 has an automatic needle threader, an auto-stop bobbin winder, and a 4-step buttonholer. All these automatic features will no doubt make things easier for a kid just starting out on the hobby of sewing. If you can only spend under $20, then Haitral HT-CS141WPU should be in your list. It’s a real sewing machine with the price of a toy. 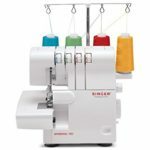 It also has an automatic bobbin winder, an on-and-off button, and a tension-adjusting screw. What’s more interesting is that you can choose to run the machine at either low or high speed at the push of a button. Controlling speed can be a challenge especially for novices and kids, so Haitral’s push button feature is definitely a plus. It also has a pedal, if your kid feels more comfortable using it. Children will be encouraged to create projects on their own if their tools make it easy for them to do so. Singer Simple 3223 was designed with kids and beginners in mind. Choosing a stitch from its 23-stitch selection is easy with the flick of a dial. Sewing cuffs and collars is also so much easier with its free arm design. Threading instructions are printed on the machine so kids don’t miss a step. It may take a while before your kids outgrow this sewing machine. It’s not only easy to operate, but also versatile and durable. Its sturdy metal frame holds everything together and will definitely last for years. It has a high presser foot lifter which makes it capable of sewing thick materials, like denim and blankets, with the appropriate needle. The advantage of lightweight and portable sewing machines is pretty obvious. Your child can set up her work space right next to yours as you teach her about the basics of sewing. This is where Haitral HT-CS141WPU shines. Kids can bring it to class or to their friends’ house where they can do their crafts together. Even adults will find great use for the handy Haitral sewing machine. It’s easy to bring along during trips because of its smallness. It also runs on four AA-size batteries, which is a smart idea. There are situations where you find yourself without an AC power source and some things need mending. The best sewing machine for kids will be one that will allow them to explore their creative potentials. Children will differ from each other in their level of interest and preferences. That part will be for you to assess. The sewing machines that we’ve featured here are all child-friendly. They offer varying degrees of versatility and durability. We’ve picked them from a wide price range, too. We believe that the cost of a machine shouldn’t hinder a child’s wish to learn about sewing.